Dave's Computer Tips: How to create a slideshow using Windows Live Movie Maker. Dave’s Computer Tips: How to create a slideshow using Windows Live Movie Maker. Whether you choose to drag and drop the photos or import them via the browse feature; don’t forget to select (highlight) all the photos in the folder. 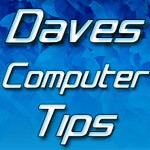 Dave's Computer Tips davescomputertips, presentations, video editing, Windows Live Movie Maker. permalink. Ask Leo: Just how easy is it to sniff network traffic?